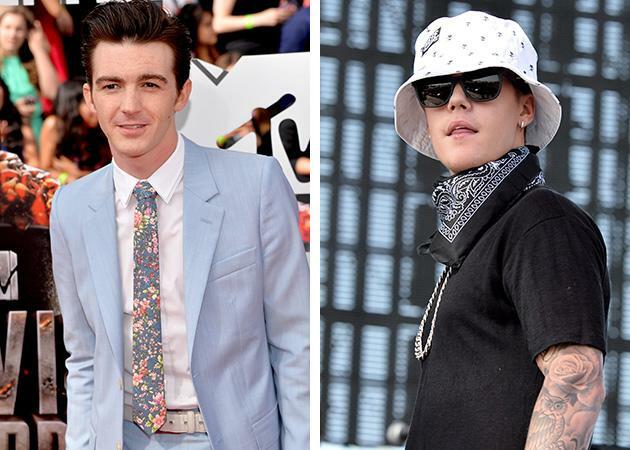 Drake Bell has been pretty vocal about his dislike of Justin Bieber, but at Sunday's MTV Movie Awards, the former Nickelodeon star told Celebuzz that he has "nothing against" the pop star. That's despite the fact that Bell has been publicly attacking Bieber for the last two years, most recently in an Instagram video filmed with Aaron Carter. Framed as a "feud" by the press, a closer look reveals the rift to be a one-sided fight started by Bell in 2012, which Bieber has only once responded to. He then followed this up with an unprovoked attack on the Biebs' guitar skills — which, of course, got Beliebers irate. I haven't listened to much Justin Bieber but his songs must be full of hate and rage because that's what his believers are filled with..
Drake and Josh was my favorite show as a kid. really. When Bieber's fans responded in kind, Bell called them "awful people." He then proceeded to tweet, “I’ve never come across an unbelligerant Belieber." He has attempted to frame his problem with Bieber as a problem primarily with Beliebers. In an interview with BuzzFeed on April 1, Bell called out Bieber for not taking responsibility for his "out of control" fans. "Justin Bieber just tweets, ‘Yeah, Beliebers, go hard’ when they’re attacking somebody,'" Bell said, adding that "artists like Lady Gaga and Justin Bieber don't come out and say, ‘I love having you as my fans, but you shouldn't be acting this way.' They just eat it all up, and I think it's repulsive." At Sunday's MTV Movie Awards, Bell told Celebuzz he didn't take issue with Bieber's work itself, despite saying he wasn't "a fan" of the "Boyfriend" singer's music. “[There’s] no jealousy or anything. He’s a pop singer, I’m a rock and roll musician,” said Bell, who filed for bankruptcy in February. He added: "There’s no bone to pick there with artistry." Maybe Bieber should leave the U.S. after all — at least then he could get away from Bell.